MAHA SARAKHAM – In 1996, a group of government officers from the Agricultural Land Reform Office (ALRO) proposed an alternative to the reigning model of chemical farming. Buoyed by their idealism and Japanese funding, they initiated a pilot program that trained and established a small network of organic farmers. The result is a community of 900 farmers in four Isaan provinces who now farm a far greater diversity of crops, reject agrochemicals altogether, and are equipped with the skills to package and market their organic goods locally. In the last few decades, Thailand has implemented a series of government policies that incentivize farmers to produce cash crops like rice, cassava, rubber, and sugarcane. Now an international leading exporter of rice and rubber, Thailand has successfully stimulated its agricultural sector, helping reduce the national level of poverty dramatically. But with this increase in cash crop farming has come a heavy dependence on chemical fertilizers and pesticides – agrochemicals continue pouring into the country and Thailand’s fertile soil is slowly drying out. High levels of agrochemicals found in Thailand’s crops last year have also brought international attention to Thailand’s farming habits. 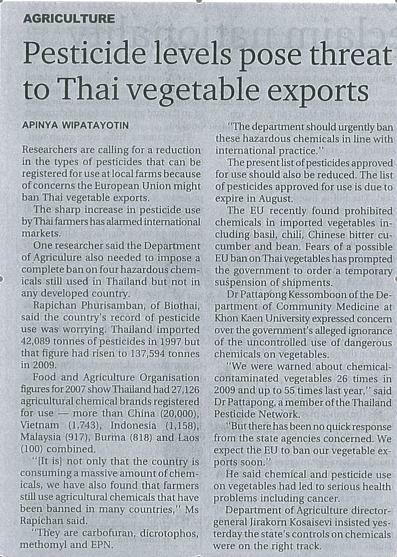 Last year, the EU threatened to ban Thai exports on many vegetables, citing dangerous levels of pesticides. In the last ten years, imports of pesticides have more than tripled in Thailand and many worry that without an official monitoring system in place, farmers are likely overusing agrochemicals in attempts to increase their yields and fill their pockets. Concerns for consumers’ health and Thailand’s environment are rapidly rising. Making a switch back to organic practices in Thailand, however, is far from simple. For one, agribusinesses can offer high prices for exportable goods and farmers are easily enticed by the promise of a greater income. In addition, the government protects its cash crop farmers far better than its organic farmers who diversify the crops in their fields. According to the Bank for Agriculture and Agricultural Cooperatives, every administration since 1995 has implemented policies that offer insurance to cash crop farmers and price guarantees for their crops. Farmers who opt to farm a variety of crops, on the other hand, are left with far more risk in a country prone to natural disasters. With these concerns in mind, the Agricultural Land Reform Office (ALRO) contacted farmers in Sakon Nakhon, Mukdahan, Mahasarakham, and Khon Kaen. Over many years, the ALRO succeeded in teaching former cash crop farmers the benefits of going organic. Though Japanese funding has now run out, these farmers are nearly self-sustainable. They share tasks with one another in co-ops, work together to standardize suitable prices, and sell their goods at local green markets. And they have found that with farms as diverse as the local supermarkets, debt is no longer a concern nor income a worry. The current administration, however, has shown no intention of expanding the program further. To learn more about the program, the Isaan Record met with farmers who had worked with the ALRO to return to organic practices. Sakhon Thabthimsai, an organic farmer in Borabue district of Mahasarakham province, tells his story in the video above. The ALRO’s project is just one of many efforts in Northeastern Thailand to rethink and reform the kinds of agriculture being practiced in this part of the country. For more information, visit the Alternative Agriculture Network’s website here.